Tooku de kikoeru kaze ni kodomo-tachi no "mata ashita"
From far away, carried on the wind, I can hear the voices of children saying "See you tomorrow"
This song is the Japanese ending theme for one of my favorite big screen feature of (one of my favorite show and game) Pokemon: the 4th Pokemon Movie entitled Pocket Monsters the Movie: Celebi A Timeless Encounter. In the US version, they renamed the title into Pokemon 4Ever... which sounded awesome for me back in the released year, yet sounds cheesy and pretty inappropriate for the present me who now prefers the Japanese version much much better. When the film was released in 2001 (yes, 10 years ago... Ouucch), it features the 2nd generation Pokemons, from the Gold - Silver - Crystal (Game Boy Color) games or the Johto arc. These batch of Pokemon -which featured Chikorita, Totodile & Cyndaquil as our three starters- were 'revived' when the remake version entitled HeartGold and SoulSilver were released for the Nintendo DS in 2009. Hence Celebi, the main star Pokemon in this movie, returned to the big screen on the 13th movie (last year). This movie resolved around a particular hunter, or we could say a 'Pokemon Collector' who wanted to own a legendary grass-type Pokemon that has the ability to travel through time. The Pokemon is the green little fairy-like Celebi. 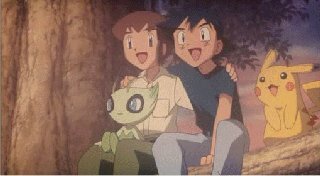 When Celebi was attacked and cornered, a young boy named Yukinari (US: Sam/Samuel) helped him, thus the shocked Celebi used its (I forgot its gender in the movie) power and transported Yuki-kun through time, 40 years ahead, where he eventually met our hero Satoshi (US: Ash Ketchum), his best friend Pikachu and of course Kasumi (US: Misty) and Takeshi (US: Brock). Celebi was still in danger though, cause another hunter, this time a member of the Rocket Team wanted to capture that Pokemon using dark ball. The legendary Suicune raced all its might to help Celebi from danger. What made me fell in love with this movie, is the bond of friendship between Satoshi and Yuki. They acknowledged each other at the very first meeting, just like David and Jonathan (Bible-wise). 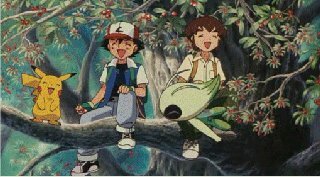 They buddied very close instantly, and helped the 'dying' Celebi from the danger of the evil hunter. The biggest problem though, was that both of them came from a different era... and as Celebi needed to return back to its time, so did Yuki who had to go back to his village and family. Their friendship was awesome, but they must bid farewell. 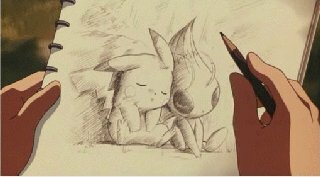 It was a very touching scene, at least for me personally, and yes... it's the first time ever a Pokemon movie made me wept in tears. Yes, this movie really did that to me, though perhaps it's because I'm a mellow guy. The song, eventhough it doesn't describe the movie explicitly... is a very fitting number to describe the tender warmth of friendship between Satoshi and Yuki. Hearing this song, my mind immediately took me back to the scene where the boys saw sunrise together with Pikachu and Celebi on top of a tree. It was a touching scene, and showed how majestic their friendship was. The message of this song, is about going back home after accomplishing something good in life, and hoping that the weather tomorrow will be fine just as today. I can sense that this movie is being sung from Yuki-kun's point of view, whom after making a precious travel to the future, returns home, while hoping to see his best friend once more somewhere in the future. Weather can means condition, feeling or situation... So, hoping a nice weather for tomorrow, can definitely mean 'hoping something good will happen again and nothing will change'. Well, that's just from my perspective. As I've said before, Japanese can be analogical so they can have different meanings. The song can be interpreted as easy as 'hoping there will be no rain or thunderstorm tomorrow', or a more poetic approach as in 'I've felt today is a success, and looking forward for the same or better achievement tomorrow'. As we're in the context of friendship, then I'd definitely choose that this song is a prayer for a friendship that will never change, eventhough space or time drifts us apart from our true friend. Touching isn't it? Hope you enjoy this cover... As always, thanks for reading (and listening of course)... and be sure to call or contact your best friend(s) after you listen to it, to tell them that you wish for 'tomorrow's weather' to be fine as well... praying for your friendship to surpass time, and will always be a 'fine weather' in your life. Cherished your friendship, till the end of time... cause they are your hidden treasures that will never ever be replaced.